The topic of personality development lies at the interface of two larger and more familiar topics: personality theory and developmental psychology. However, as the present summary will demonstrate, most explorations of personality development focus on broad issues of identity and not on the narrower personality traits and dispositions that dominated the field of personality theory during the end of the 20th century. For all intents and purposes, the topic of personality development could as easily be termed “person development.” In ways that will be made clear in this article, most people undergo significant psychological change as they age. With respect to their psychological characteristics, infants become children, who become adolescents, who then become adults. These progressive age-related changes are much more than changes in what or how much the person knows. People “grow up” as they age, and an important part of growing up entails progressive shifts in how they know (in contrast to what they know) and, in particular, how fully they understand themselves and others. Interestingly, not everyone “grows up” to the same extent or at the same rate. We all know chronological adults who are, nonetheless, psychological adolescents. Indeed, knowing where someone is on the path of increasing psychological maturity may be the most important thing we can know about a person. Developmental differences in personal maturity are differences that make a difference. This process of personality development, of growing up, is the focus of the present article. Much of modern personality research has focused on personality traits and attendant dispositions to act in certain ways in social situations. This article provides little focus on the development of these sorts of personality traits. It’s not that changes in personality traits don’t occur. Operating out of the Five Factor Model of personality, Costa and McCrae (1994) concluded that modest changes in individuals’ positions along five basic personality dimensions do occur but are “essentially finished by age 30” (p. 148). In contrast, increasing levels of psychological maturity, ego identity, perspective, and integrative complexity are pointedly not typically complete by the age of 30. This article focuses primarily on the development of these more basic qualities, the structural qualities of a person’s identity. The nature of these qualities and the challenges of studying them can be illustrated by a brief example. …before when I was actually living at home I never wanted to spend time with my parents. I never wanted to get to know how they were doing, if they were feeling okay, how they were doing emotionally. And now I’ll go home and I find myself wanting to go out to eat with them, so I can just talk with them one-on-one and get a feel of how they’re doing.… And my mom, she just started a new job, and I honestly care about how she’s doing. Like before, it wasn’t really about how much I missed them. Before, I would miss them because they’re my parents, and you love your parents. But now it’s more of a friendship thing than just the love that comes with being the child of a given parent. Now it’s more about the friendship and the bonding that I can do with them. …it was good because of the fact that I wanted to do it. It was me setting it up, not her asking me to go to lunch with her.…Because before she’d beg me to go and do something with her, and I never wanted to do it. And now, I was just excited that it was me—I had the feeling to want to do it. There are many ways that one could describe the changes Jason was experiencing. Not all of these changes can be considered “development” from a psychological perspective. Thus, it is instructive to identify the features of Jason’s remarks that would or would not lead a developmental psychologist to conclude that Jason’s experiences reflected personality development. Perhaps Jason has merely acquired a new social skill, asking people to go out to lunch, and now he’s using that skill when he goes home to visit his parents. If so, his personality hasn’t changed, only his behavior has. Or perhaps it’s even simpler than that. Maybe the change Jason describes is due to a change in his circumstances, not his personality. After all, now that he’s away at college he doesn’t see his parents very often. So when he’s home he makes an effort to spend time with his parents so he can maintain the level of contact with them to which he had grown accustomed as a high school student. Arguably, neither of these simpler explanations captures the source of Jason’s excitement. In the remainder of this article you will learn both what this sort of personality development is all about and how some of the major theorists from the second half of the 20th century, from Erik Erikson to Robert Kegan, have shed light on the sort of changes we see happening in our young college student. How Do Psychologists Define Personality and Personality Development? There is no consensus among modern psychologists about how to define personality. Lay persons and some trait theorists tend to use the term personality to describe a set of social skills and personal attributes that affect how someone is experienced by others—as in “Jennifer has a sparkling personality” or “Philip has zero personality.” Psychologists with an interest in personality development, as distinct from the development of social and interpersonal dispositions, generally favor definitions of personality development that reflect increasing psychological maturity. So, for example, while 21-year-old Jennifer may have a “sparkling personality,” shouldn’t we expect her sparkling personality to look quite different when she reaches middle age? If her “personality” doesn’t change during that 20- to 25-year period, wouldn’t that be a source of some concern? Jason may have many of the same personality characteristics he had when he was a junior high school student (he seems to be rather friendly and upbeat), but arguably something is happening that most of us would see as evidence that he is growing up. He is moving from seeing his parents as people who do things to you and for you to seeing his parents as people in their own right. Some young adults never make this transition. What Is It About People That Changes As They Grow Up? In recent years there has been a renewed interest in personality traits. Stimulated by the Five Factor Model of personality, psychologists have been impressed by the degree to which the trait terms people use to describe one another (e.g., friendly, extroverted, sensitive), as well as actual self-descriptions and descriptions of others’ personality traits, can be summarized using five relatively independent personality dimensions. These five dimensions (often labeled Extraversion, Agreeableness, Conscientiousness, Emotional Stability, and Openness to Experience) appear to work well in describing individuals at different ages, and across many different cultures. 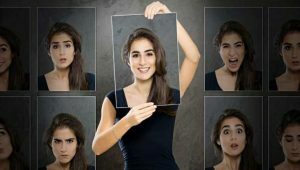 However, these traits do not capture many important features of personality, and are not the features of personality that are the focus of most psychologists who study personality development. Indeed, these broad personality traits, once they become a consistent feature of someone’s personality—usually in middle childhood, tend to be remarkably stable across the remainder of one’s life. What is not adequately captured by merely describing someone’s personality dispositions or traits are the ways in which people organize their behavior, cognitions, and feelings in the process of trying to make sense of their personal, interpersonal, and cultural experiences. More than dispositions to act in certain ways, personality includes stable features of individuals’ motivations, assumptions, and predictions about social reality, and strategies for adapting to the demands of the social world. In this sense, personality is much more than a set of dispositions to behave in certain ways. Personality organizes and operates on experience. It is the part of each of us that selectively attends to certain experiences and not others, attaches particular meaning to those experiences, seeks to participate in certain aspects of the social environment and not other aspects, and actively shapes and manipulates the circumstances of one’s social and cultural life. These more complex aspects of personality develop and change over time. As suggested in the interview with Jason, not all change is development. The convention that will be adopted in the present article is that personality development refers to certain kinds of durable internal changes in the person. Jason’s external behavior toward his mother has surely changed; he now asks her to go to lunch. However, even if he were to stop asking, it appears that Jason has a different internal view or understanding of who his mother is, a person in her own right, someone who has interesting qualities apart from being the mother who takes care of him and provides him with things that he needs or desires. Jason’s mother hasn’t changed. She has always been more than merely Jason’s mother. What has changed is Jason’s capacity to construct this more encompassing view of his mother. It is a view that is not likely to be lost. Once one can see more of something that was there all along, it’s pretty hard to stop seeing it. Jason has undergone personality development. As a result of his new capacity to see another person more fully, we can expect to see additional evidence in his behavior of this enduring internal developmental change. One final feature of personality development is that it entails capacities that enable the person to adapt to or cope with environmental demands and environmental complexity. Jason’s newfound capacity to see beyond his own needs in constructing an understanding of what other human beings are all about will help him be more successful in relationships beyond that with his mother. For example, given the opportunity to exercise his new capacity, Jason will be better able to appreciate the personal qualities of a future spouse, as well as what it means to become a “professional” rather than merely someone who does a particular job. Jason will be more successful or “better adapted” in both endeavors, marriage and vocation, because he can appreciate people in ways that are unconnected to his need for them. It may seem too obvious to mention, but personality development is about psychological change. As a result, one of the challenges in investigating personality development is deciding how best to study change. Assume for a moment that you have become interested in the sort of change that our college student, Jason, appears to be experiencing. You begin wondering if most 19-year-olds have a similar experience. They start becoming interested in their parents’ lives and feelings in a way that is no longer connected to what their parents can provide or withhold. You have several options about how you might proceed. If you want to get some quick answers to your question, you could proceed by assessing the parental views of three groups of individuals, perhaps 15-year-olds, 20-year-olds, and 25-year-olds. If you are indeed measuring a variable that is a feature of adolescent or young adult personality development, then you would expect the older children’s views of their parents to become less about their own needs and more about their parents’ personal experiences. This investigative approach is termed “cross-sectional” and has the advantage of providing you with answers relatively quickly. The cross-sectional approach has drawbacks, though. One drawback is that you can never be sure that the age differences you find are in fact a function of development. For example, what if it is the case that back when your 25-year-olds were in their late teens, TV was filled with highly popular sitcoms that focused on family life. Subsequently, the popularity of such TV programs faded and family-oriented programs were replaced by a variety of programs focused on competition and individual achievement, such as “Survivor” and “American Idol.” As a result, your 25-year-olds spent many hours watching programs about parents and children, while your 20-year-olds spent many hours watching programs about advancing one’s own goals at the expense of others. So even though your 25-year-olds were much more attuned to their parents’ experiences than were your 20-year-olds, the difference could be due to the two groups’ having been exposed to different types of popular TV programs. To sort this problem out, you would need to turn to the other major experimental method used to study development, the “longitudinal” approach. In this approach you would assess your participants at two or more points in time. You might, for example, want to reassess your 20- year-olds when they were 25. Do they show evidence of becoming more attuned to their parents’ inner lives than they did when you assessed them five years earlier? If so, then you have more confidence that you have detected personality development. The longitudinal approach also has its drawbacks. Most obvious is that it requires more time and effort than the cross-sectional approach. In our example, you had to wait five years before you were able to find out if there had been any change with respect to the parental views of your longitudinal study participants. You would also have to make sure you could locate all of your participants five years after first assessing their views and then convince them to take the time to be reassessed. Even if they agreed, it is possible that their responses might have changed merely because they were familiar with your study and were being asked the same questions a second time. Notice that you didn’t have to deal with these potential complications when using the cross-sectional approach. An even more serious complication of the longitudinal approach may result if you have a significant amount of “attrition” from your original sample—if you are unable to reassess a significant number of your original participants. Let’s say that, for some reason, it was much harder to recontact participants who were highly focused on themselves and their own individual interests. Perhaps these self-interested participants were more likely to move out of the area and away from their families or were still around but were much harder to convince to participate in your study a second time. A loss of a particular type of participant would be termed “differential attrition” and would make it very difficult to interpret your longitudinal results. If you found that at age 25 your remaining participants were more attuned to their parents’ inner experiences than your participants had been at age 20, it could be due to the fact that you had lost from your sample of 25-yearolds those individuals who would have still been focused upon themselves. So one thing you need to be alert to when reading the results of longitudinal studies is whether there is attrition, and if there is, whether the researcher presented information that suggests the attrition was random as opposed to “differential.” One common way in which researchers try to solve the problem of differential attrition is by presenting only the longitudinal results for individuals who participated throughout the entire study. However, even in this case one needs to be aware that the results reported may not apply to individuals who had characteristics that caused them to drop out of the study. There is a final methodological issue relevant to investigating personality development using a longitudinal approach, and that concerns whether one chooses to look at individual or group data. If you look only at group effects, you lose the ability to learn something about the process by which individuals change, or as is often the case, fail to change. As some developmental researchers have noted, it may be the case that rather than taking place through a fixed set of progressive stages, some personality development may be better described as taking place through a number of different “trajectories” or “pathways” (Bosma & Kunnen, 2001). We turn now to brief summaries of some of the more prominent theories of personality development that incorporate the sorts of changes that are taking place in Jason. As you will see, there is considerable variation in how different theorists have conceptualized these enduring, internal, and adaptive changes in the person. Child psychoanalyst Erik Erikson put forth one of the oldest and best-known theories of personality development. Writing in the 1950s and 1960s, Erikson (1968) provided a stage theory of identity formation and consolidation in which he described eight universal identity crises that occur in a fixed sequence across the human life span. Each identity crisis is precipitated by changes in cultural expectations that correspond to expected psychological and biological changes in the person. For example, in Erikson’s Stage 5, which typically occurs somewhere between the ages of 13 and 20, depending upon various cultural and biological factors, most cultures expect children to begin to act like adults. In Western cultures we refer to individuals in this age range as adolescents, and we expect them to begin acting like productive members of society by getting an education or finding a vocation, dating or marrying, and showing a new level of concern about how their current decisions and actions might impact future life success. Erikson believed that viable societies begin making these demands on adolescents just at that point in the life span when biological and psychological changes are taking place that provide adolescents with a good chance of successfully meeting these demands. After all, Erikson noted, societies have a vital interest in producing new members who can ensure their continued success. Among the personal changes that help most adolescents cope with these societal demands are a new capacity for self-reflection and an ability to internalize others’ views. According to Erikson, the predictable identity crisis of adolescence results from the confluence of these internal and external changes. In response to these emerging internal capacities and growing external pressures, adolescents must figure out who they are to become and whether that new identity will be recognized and supported by others. Erikson argued that whether adolescents will be successful in forging this new, more adult-like identity depends both on the quality of the societal support provided and on the strengths the adolescent can bring to bear on the current crisis. These strengths arise from the successful resolution of preceding identity crises. Three succeeding identity crises, focused in turn on achieving personal and vocational commitment, selflessness, and life integration, will similarly result from predictable internal changes and external pressures. Erikson believed that each succeeding identity crisis offered the opportunity for one to address earlier identity issues if those identity issues were not successfully resolved when they were first encountered. Erikson’s developmental theory both is well known and has stimulated considerable related research. The most well-known derivative of Erikson’s views is the theorizing and related research program initiated by James Marcia (1993). Drawing upon Erikson’s formulation of the Stage 5 adolescent identity crisis, Marcia described an “identity status” model in which he classified adolescents as occupying one of four statuses depending on where they are with respect to the resolution of their adolescent identity crisis. Marcia’s “diffused” status obtains where no exploration has taken place and no identity has been achieved. His “foreclosed” status is characterized by a superficial commitment to an adolescent identity without going through the process of personally struggling with identity issues. These adolescents may, for example, unquestioningly adopt their parents’ values and expectations. The “moratorium” status exists when active exploration of various identities is underway but the adolescent has not yet committed to a single identity. The most evolved status is “achievement,” where the adolescent has committed to a particular identity after an extended process of personal exploration. Research has focused on both confirming the existence of the four identity statuses as well as exploring the process by which some adolescents move through the less satisfactory statuses to “achievement” while others appear to get stuck or cycle repeatedly between diffusion and moratorium (for a review, see Bosma & Kunnen, 2001). Little or no research has been focused upon the important question of what facilitates transitions from one identity status to another. As is true of most comprehensive theories of personality development, Loevinger concluded that rather than taking place gradually, ego development takes place in spurts or stages, where stages of ego development represent relatively stable periods of meaning making. At each successive stage, the individual has developed a new, more complex way of constructing meaning. Experiences of the self (one’s thoughts, feelings, and behaviors) and interactions with others are made sense of using the current stage’s framework for making sense of those experiences. Experiences and interactions that don’t fit the current sense-making framework are either ignored or distorted to fit the current framework. It is this so-called “selective gating” that confers the developmental stability that results in stages. Only when experiences of the self and others that cannot be adequately understood using the frames of one’s current ego development stage meet some threshold, and can no longer be ignored or distorted, does the person enter a transition phase on the way to the next ego development stage, a stage that will allow the person to make better sense of the discrepant experiences. In her most recent summary of the stages (Hy & Loevinger, 1996), Loevinger described eight stages, E2 through E9, and acknowledged, but did not describe, an E1 infancy stage. Loevinger arrived at her stages without using an a priori theory about how many stages there would be or what the different stages would look like. Instead, she used a “bootstrapping” method, whereby experts in personality development took the responses of a number of participants ranging in age from early adolescence through adulthood and created groupings of responses that seemed both similar to one another and significantly different from other groups of responses. When there was general agreement that participants’ responses had been placed into distinct and conceptually meaningful groups, Loevinger used both participants’ ages and judgments about the progressive sophistication or complexity of the response groupings to order the eight developmental stages. In the initial version of her stage theory (Loevinger & Wessler, 1970), the major stages were given a number and a capital “I” (I1 through I6) and two transition stages were designated with two adjacent stage numbers (I-3/4 and I-4/5). If you read the early literature on ego development, you may encounter these “I” designations rather than the “E” stages of the current theory. We can use Jason, the college freshman whose interview was excerpted at the beginning of this article, to get a better feel for what Loevinger’s ego development stages describe. We will need to examine the content and structure of Jason’s remarks to make a guess about his current stage of ego development. It is worth noting that examining Jason’s statements was not necessary when we were considering Erikson’s theory of identity development. Merely knowing that Jason was 19 years old and a member of a Western culture, we would expect Jason to be finishing up Erikson’s Stage 5 (Identity vs. Role Confusion) and entering Stage 6 (Intimacy vs. Isolation) because biological maturation and societal expectations are expected to precipitate each of Erikson’s identity crises. Loevinger’s theory has a different view of the impetus for stage progression: One must encounter a sufficient level of discrepant experiences to precipitate development to the next stage. If Jason has been underchallenged, then he could be at a developmentally lower or earlier stage than another 19-year-old who has had to deal with a greater number of life experiences that he or she could not easily assimilate to the sense-making framework of a lower stage. We will consider three of Loevinger’s stages that could describe Jason: E4, E5, and E6. Individuals at Loevinger’s E4 (“Conformist”) stage are solidly identified with their dominant reference group. They have a simplistic, conventional view of rules, and they believe there is a right and a wrong way of doing things. Expectations that one should follow rules and meet social expectations are thought to apply to almost everyone. Social approval for following the rules and acting appropriately is highly valued, and social disapproval for not doing so is avoided. Individuals at this stage are said to be preoccupied with surface characteristics such as one’s appearance, possession of “cool stuff,” and membership in the right groups and cliques. Inner experiences are described in rather simplistic terms (e.g., happy, sad, mad, excited, bored) and others are viewed in equally simplistic terms. There is little in Loevinger’s description of E4 that seems to capture Jason’s concerns. Jason seems uninterested in having his mother’s approval and there is no sense that he is asking her to lunch and taking an interest in her experiences because that is the “right” thing for a son to do. Jason is probably not making sense of his new experience of himself in relationship to his mother using the framework of Loevinger’s E4. Individuals at Loevinger’s E5 (“Self-Aware”) stage have begun to realize that people have characteristics that exist outside of surface characteristics and their conformity (or lack of conformity) to the expectations of society or one’s group or clique. This realization leads to a new interest in internal experiences as something that can vary widely even among members of the same group. Often there is a growing awareness of the differences between the self and members of groups with which one was closely identified at the previous stage. As a result, there is a growing sense that there are legitimate exceptions to the rules and to the value of social conformity. Loevinger’s E5 stage seems much closer to the experiences Jason is describing. He is interested in getting to know more about his mother’s experiences in her new job quite independent of her role as his mother. Jason is also intensely interested in his own inner motivations and his changing experience of his mother, but before we conclude that Jason is functioning at Loevinger’s Stage E5, let’s consider her description of the next stage. Individuals at Loevinger’s E6 (“Conscientious”) stage evidence movement away from a belief that there are certain rules and social expectations to which everyone should adhere and toward the adoption of self-evaluated standards. Acceptable behaviors are not just a function of what others think is appropriate but are increasingly judged acceptable or unacceptable using one’s own personal feelings. Because what is acceptable has moved inside the person at E6, it now becomes important, in judging another’s actions, to know what the person’s motives for those actions were. Merely having broken a rule is not nearly as important as knowing how one’s rule-breaking made another person feel. Individuals functioning at E6 are self-reflective and are likely to describe their inner experiences in great detail. Because these individuals make decisions based on internal standards, they recognize multiple possibilities, and often describe a sense of having to make choices based on identifiable personal reasons. There is an orientation toward long-term goals and gradual self-improvement. There would appear to be little in Jason’s remarks that reflect the core issues and concerns of this stage. Although it is possible that Jason might have expressed different concerns, were he not talking about his new interest in spending time with his mother, Loevinger’s E5 (“Self-Aware”) stage seems to best capture how he is struggling to make sense of his experiences in a new, more complete manner. At this point, you may be wondering how Loevinger assesses an individual’s stage level. In much of personality research, particularly with respect to trait and dispositional approaches such as the so-called “Big-Five” model described at the start of this article, researchers rely on self-report questionnaires. From Loevinger’s perspective, the main problem with this approach is that it is the questionnaire’s author who creates the response categories, not the person being assessed. Because Loevinger is seeking to determine how an individual imposes meaning upon the experiences he or she is encountering, she uses a free response or “projective” approach to assessment. Her primary assessment tool is a 36-item sentence completion form on which participants write responses that complete sentences such as “The thing I like about myself is…” and “Rules are…” (Hy & Loevinger, 1996, p. 28). Loevinger provides an extensive scoring manual where one determines a person’s developmental stage by matching each respondent’s sentences with examples determined to be typical of individuals at each of her ego development stages. Such an approach to assessment is not without problems, such as the need to establish interrater agreement, but its strength is that the sentences are created by the respondent and not the assessor, which presumably increases the likelihood that one is getting a reasonable snapshot of how the individual being assessed imposes meaning on his or her experiences. Because Loevinger has provided an accessible, if somewhat demanding, assessment tool for assessing a person’s ego development level, her approach has generated a reasonable amount of empirical study (Westenberg, Blasi, & Cohen, 1998). One of the weaknesses of Loevinger’s theory of ego development is its lack of an integrative theory of ego development. Despite the fact that Loevinger described the ego as a “master trait” that provides overall coherence to one’s experience of self and others, she never provided a sound theoretical basis for this view and what it is in the person that generates greater and greater ego maturity. This shortcoming is evident in her admission that her eight stages may include transitions as well as stages, but that it is difficult to distinguish between the two. Beginning in the 1980s, Harvard psychologist Robert Kegan outlined a theory of the development of the self that appears to have the potential to overcome these theoretical limitations. Drawing on an implicit feature of Piaget’s developmental theory, Kegan described six stages in the development of the self that are based on progressive transformations of the developing person’s perspective-taking capacities. Following an infancy stage, Stage 0, in which the infant lacks the capacity to distinguish between self and other and there is no coherent perspective taking, the toddler entering Stage 1 makes sense of her or his experience using a single, coherent perspective. Understanding that others have a separate and potentially different perspective from one’s own does not emerge until middle childhood, as Kegan’s Stage 2. By late adolescence an even more complicated perspective-taking capacity, the capacity to hold two or more perspectives together simultaneously, becomes the fundamental basis of Kegan’s Stage 3. As with each successive gain in perspective-taking capacity, this new ability to experience multiple perspectives at the same time again transforms the developing person’s sense of the self and others. In Kegan’s view, the capacity for simultaneous perspective-taking permits the Stage 3 individual to apprehend complexities that were present but could not be appreciated using the simpler perspective-taking capacities of earlier stages. Stages 4 and 5 are characterized by the emergence of even more complicated perspective-taking capacities. The way in which Kegan’s theory provides a better grounded basis for describing developmental stages than does Loevinger’s bootstrapped approach can be seen by using Kegan’s theory to again analyze the remarks of our college student, Jason. Research using Kegan’s theory suggests that college freshmen are likely to be in Kegan’s Stage 2, Stage 3, or in the transition between those two stages. Let’s start with Stage 3. Kegan asserts that the capacity to take two distinct perspectives and hold them together at the same time, which is the new perspective-taking capacity at Stage 3, creates certain new personal and interpersonal experiences. Taking the interpersonal first, if Jason were functioning at Stage 3 we would expect him to show evidence that he was beginning to make his mother’s experience of him (one perspective) a part of his experience of himself (another perspective, taken simultaneously with the first). He might say something like “When she used to beg me to go and do something with her and I’d refuse, it would hurt her feelings. Thinking about that now makes me feel bad.” He would be taking her feeling bad and making it a part of his own feelings about himself. However, if you look carefully at what Jason says, he doesn’t, in fact, feel bad as a function of his mother’s feelings about him. Instead, his mother’s desires—“before she’d beg me to go and do something with her”—are viewed by Jason as an alternative to his own desires—“and I never wanted to do it.” He appears not able to incorporate how his refusal might make his mother feel as a part of his own experience of himself. Thus, at the interpersonal level, Jason appears to still be functioning at Kegan’s Stage 2. He clearly perceives there to be two different perspectives or desires (his mother’s and his own), so he is not functioning at Stage 1, but the two points of view remain entirely separate in his experience of them. Now let’s consider the intrapsychic aspects of Jason’s remarks. At Stage 3, rather than merely being aware of one’s own feelings and thoughts, which is a Stage 2 capacity, one begins having feelings about one’s feelings and thoughts about one’s thoughts. In other words, Kegan suggests that the Stage 3 capacity to hold two thoughts or two feelings together at the same time (another expression of simultaneous perspective taking) creates, for the first time, self-reflectiveness, or what clinical psychologists sometimes refer to as “psychological mindedness.” In this respect, Jason appears to be moving a bit beyond Stage 2. Indeed, what has struck Jason as new and different is the way he is experiencing his experience of his mother. As he puts it, “…it was good because of the fact that I wanted to do it…and now, I was just excited that it was me—I had the feeling to want to do it.” In short, Jason is telling us that he is excited about how he is feeling. He’s having feelings (excited) about his feeling (wanting to be with his mother), which is evidence that at the internal or “intrapsychic” level, Jason is becoming more Stage 3. Indeed the entire interview from which the excerpt is taken places Jason in the Stage 2 to Stage 3 transition. What distinguishes Kegan’s theory from Loevinger’s is his use of a single theoretical basis—perspective-taking complexity—for describing each of his developmental stages. Lacking an overall theoretical basis for identifying her stages, Loevinger is left having to describe a collection of behaviors, thoughts, and feelings that characterize each stage without having any clear sense of what it is that produced each stage’s particular features. In contrast, Kegan is able to use his underlying theoretical framework to provide an explanation for why many of the features Loevinger locates together in each of her stages can be expected to occur together. Kegan’s framework can also be used to identify transition phases that, from his perspective, are distinct stages. In this way, one can reduce Loevinger’s 10 stages to 6 stages and 4 transitions that correspond closely to Kegan’s six stages. Kegan’s theory is not without its limitations, however. Foremost is the difficulty of his method for assessing individuals’ developmental levels. Kegan agrees with Loevinger that because one is assessing how individuals make sense of their experience, questionnaires will not provide valid assessments. Instead, like Loevinger, Kegan favors a free response approach, where the person being assessed generates his or her own responses to open-ended stimulus materials. However, whereas Loevinger relies on sentence stems for her assessments, Kegan uses open-ended, face-to-face interviews, and asks respondents to describe recent experiences that evoked strong emotional reactions. The interviewer then follows up the respondent’s descriptions of those emotionally laden situations with a series of “Why did you feel that way?” questions designed to elicit the person’s perspective-taking capacities. It is a process that requires extensive training, and establishing adequate interrater agreement is sometimes hard to achieve. Despite its challenges, Kegan’s theory is slowly attracting the interest of other scientists, most notably organizational psychologists like Wifred Drath at the Center for Creative Leadership and William Torbert, former dean of the business school at Boston College. Both have written books that draw upon Kegan’s developmental theory in trying to make sense of leadership and organizational behavior. There are many approaches to the study of personality development in addition to Erikson’s, Loevinger’s, and Kegan’s. But unlike these three approaches, none are as comprehensive, and some may not even qualify as developmental approaches with respect to the way I have defined personality development in this article. Some approaches have a more restricted age range; some approaches focus on a particular gender; other approaches focus on only part of the life span; and still other approaches focus on a single, narrow aspect of personality, such as moral decision making or conceptual development. We will begin this brief overview with some of the approaches that have the longest history, move to approaches with a narrow focus, and finish with two of the more promising approaches that have emerged in the past few years. Daniel Levinson (1968) and his colleagues at Yale University utilized open-ended interviews to identify patterns of personality change from late adolescence through middle adulthood. His primary focus is on what he called the changing “life structures” that a person constructs to organize his or her approach to the tasks typically encountered during each of adult life’s changing “seasons.” Levinson provided a rich description of the many struggles that occur as one moves from the challenges of establishing financial and emotional independence in early adulthood to building a career and family during middle adulthood and later reevaluating and reassessing previously held dreams and aspirations. In many respects, Levinson’s work is less theoretical than descriptive, and it is not always clear whether he is describing changing patterns of adaptation or changes in personality. Like our next theorist, Levinson was influenced by the work of Erik Erikson. George Vaillant (2002) is best known for his careful analysis of several in-depth longitudinal studies of Harvard University students, which followed samples of graduates for as long as 45 years. In an approach similar to Erikson’s, Vaillant identified a series of developmental tasks that people typically encounter as they move through adulthood. As a psychiatrist, Levinson was interested in what distinguished psychologically well-adjusted graduates from those who were adjusting less well to adult life. A developmentally significant feature of this focus on adjustment was Vaillant’s attempt to describe six increasingly mature mechanisms for dealing with the anxieties and challenges of adulthood. At the highest level was what he termed “altruism,” where one attempts to reduce anxiety and uncertainty by devoting oneself to helping others, which contrasts with a lower level strategy, “autistic fantasy,” where one deals with anxieties by daydreaming about favorable outcomes rather than taking action to confront the sources of one’s anxieties. Successful development entails meeting the demands of adulthood’s predictable challenges and developing the inner resources to be able to do so with a manageable level of personal distress. Like Levinson’s work, Vaillant’s work is as much descriptive as it is theoretical, and is focused as much on changing patterns of adaptation as it is on changes in personality. Using a combination of longitudinal and cross-sectional methods, University of California professor Ravena Helson (1993) and her colleagues followed the adult life experiences and personality changes in two sets of Mills College graduates. Like Levinson’s and Vaillant’s mostly male participants, Helson’s female college graduates went through significant periods of reevaluation and adjustment in their views of their lives and themselves. Many of these well-educated women focused considerable energy in their 30s and early 40s on the issue of forging an independent, self-authored identity, a quest that was accompanied by a decline in typical measures of femininity. The successful women described themselves as developing greater self-confidence, independence, and self-definition. They showed a concomitant increase in coping skills and the emergence of long-term commitments to cherished values. Helson pointed out that the pattern of changes and struggles she observed are, in some important respects, different from those experienced by men. Although much more limited in its scope than Helson’s work, Harvard professor Carol Gilligan (1982) provided an influential theory of what she sees as the central developmental issue of women’s adult development. Gilligan suggested that, in part because of culturally based gender expectations, most adult women come to feel torn between caring for others and promoting one’s own self-development. Gilligan’s theorizing provides a possible theoretically based way of understanding what Helson sees as women’s striving for self-definition. Another researcher who has focused on the critical issue of the development of self-authorship in early adulthood is Marcia Baxter Magolda (1998), a professor of educational leadership at Miami of Ohio. Baxter Magolda’s assumption is that our society demands that young adults begin to take personal responsibility for managing their lives and careers. Drawing upon Kegan’s theory of the development of the self, Baxter Magolda used in-depth interviews to illuminate ways in which naturally occurring challenges and supports as well as intentional educational programs can facilitate developmental change in both men and women. Baxter Magolda’s assertion that self-authorship is a common feature of development during the college years is at variance with the findings of the present author and his colleagues (Lewis, Forsythe, Sweeney, Bartone, & Bullis, 2005), who assessed the self-development of a sample of West Point cadets. Their longitudinal findings suggest that the key developmental issue during the college years is the establishment of a shared identity and finding oneself within groups and relationships rather than defining oneself as distinct from those connections. The difficulty of mastering Kegan’s assessment method may be contributing to the different conclusions of these two research programs. Better known to educators than psychologists, Patricia King and Karen Kitchener (1994) formulated a stage theory describing the developmental process by which people are able to make increasingly sophisticated interpretive judgments and present well-reasoned arguments about complex issues and problems. According to King and Kitchener, this developmental process cumulates in the ability to engage in “reflective judgment” that entails the ongoing evaluation of beliefs, assumptions, and hypotheses against existing data and against alternative plausible interpretations of those data. At the earliest developmental level (Stages 1 and 2), knowledge is assumed to be absolute and concrete. Assertions are either true or they are false, and authorities, like teachers and subject matter experts, have access to the truth. At these early developmental stages most issues are assumed to have a single right answer, so there is little or no room for uncertainty. In contrast, individuals functioning at King and Kitchener’s highest self-reflective stages (Stages 6 and 7) understand that knowledge is constructed, not absolute. What is “true” may depend upon the context, and the adequacy of any answer is based on what seems most reasonable according to the available evidence. Though more narrowly focused than theories of identity or the self, King and Kitchener have begun to move past mere description to focus on the critically important issue of how one promotes development. An approach to the process of identity formation and development that has gained considerable prominence in recent years is what has come to be known as “narrative identity formation” (McAdams, 1999). Bringing together the work of many researchers, this approach focuses on the ways in which individuals employ narratives or personal stories in an attempt to construct a sense of unity and meaning for the ongoing process of their lives. Much of the focus of the narratives that have been investigated thus far concerns self-understanding and the influence of relationships, family, culture, class, and ethnicity on personal identity. This approach to studying personality development appears to be generating more empirical study than any of the other approaches to personality development included in the present article. Its principle weakness is that it lacks an underlying organizing theory or framework and thereby is at risk for being descriptive of the personality development process without providing an explanation for how and why that process takes place as it does. To a great extent, the topic of personality has existed largely on the periphery of mainstream psychology. Modern psychology is not much taken with the grand theories of human experience that were so popular in the first half of the 20th century. Nonetheless, the field has progressed, and with the advent of Kegan’s integrative theory of the development of the self and the considerable interest generated by the narrative identity approach, there may at some point be a resurgence of interest in trying to understand better the process by which personality develops and human beings become more psychologically mature as they move through their lives. There is emerging evidence to suggest that by adulthood there is an increasing divergence between one’s age and one’s maturity level (Westenberg & Gjerde, 1999). Many adults just don’t seem to “grow up,” or at best their development slows dramatically. Because one’s level of personality development appears to have a major impact on so many aspects of one’s life, society has a vested interest in better understanding the process of personality development and, eventually, learning how to maximize it. For these reasons alone there is every reason to believe that the study of personality development will gain greater prominence in the future. Baxter Magolda, M. B. (1998). Developing self-authorship in young adult life. Journal of College Student Development, 39, 143–156. Bosma, H. A., & Kunnen, E. S. (2001). Determinants and mechanisms in ego identity development: A review and synthesis. Developmental Review, 21, 39–66. Costa, P. T., & McCrae, R. R. (1994). Stability and change in personality from adolescence through adulthood. In C. F. Halverson, Jr., G. A. Kohnstamm, & R. P. Martin (Eds. ), The developing structure of temperament and personality from infancy to adulthood (pp. 139–150). Hillsdale, NJ: Lawrence Erlbaum. Erikson, E. (1968). Identity: Youth and crisis. New York: W.W. Norton. Helson, R. (1993). Comparing longitudinal studies of adult development: Toward a paradigm of tension between stability and change. In D. C. Funder, R. D. Parke, C. Tomlinson- Keasey, & K. Widaman (Eds. ), Studying lines through time: Personality and development (pp. 93–120). Washington, DC: American Psychological Association. Hy, L. X., & Loevinger, J. (1996). Measuring ego development (2nd ed.). Mahwah, NJ: Erlbaum. King, P. M., & Kitchener, K. S. (1994). Developing reflective judgment. San Francisco: Jossey-Bass. Levinson, D. (1986). A conception of adult development. American Psychologist, 41, 3–13. Lewis, P., Forsythe, G. B., Sweeney, P., Bartone, P., & Bullis, C. (2005). Identity development during the college years: Findings from the West Point longitudinal study. Journal of College Student Development, 45, 357–373. Loevinger, J., & Wessler, R. (1970). Measuring ego development (Vol. 1). San Francisco: Jossey-Bass. Marcia, J. E. (1993). The status of the statuses: Research review. In J. E. Marcia, A. S. Waterman, D. R. Matteson, S. L. Archer, & J. L. Orlofsky (Eds. ), Ego identity: A handbook for psychosocial research (pp. 22–41). New York: Springer- Verlag. McAdams, D. P. (1999). Personal narratives and the life story. In L. Pervin & O. John (Eds. ), Handbook of personality: Theory and research (2nd ed., pp. 478–500). New York: Guilford Press. Vaillant, G. E. (2002). Aging well. New York: Little, Brown. Westenberg, P. M., Blasi, A., & Cohn, L. D. (Eds.). (1998). Personality development: Theoretical, empirical, and clinical investigations of Loevinger’s conception of ego development. Mahwah, NJ: Erlbaum. Westenberg, P. M., & Gjerde, P. F. (1999). Ego development during the transition from adolescence to young adulthood: A 9- year longitudinal study. Journal of Research in Personality, 33, 233–252. What are Five-Factor Model Of Personality?